Welcome to ‘Ioannina Lake Run’, a certified route from IAAF Athletic, staking place at a place that combines of innumerable historical monuments and museums with the unbelievable natural beauty of the landscape. Ioannina, the largest city of Epirus, located 450 km northwest of Athens, 290 km southwest of Thessaloniki and 80 km east of the port of Igoumenitsa in the Ionian Sea. 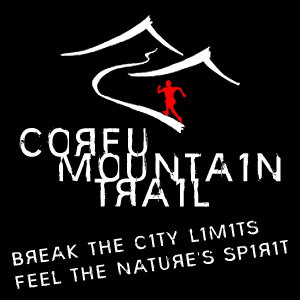 Registrations will automatically close on Friday, 1st of September 2018 or once the participation limit per race is met. • Start time of the 30km Running Race: 09.00a.m. • Start Time of the 30km Power Walking : 7:00 a.m.
Square Mavili → Avenue. Karamanlis→ Kountourioti → Papandreou→ 8th Division →Perama Login → Login to Amfitheas→ Login Longades → Login Vasiliki → Intersection Kastritsa → Intersection Drosochori → Junction to wooden bridges → Miaoulis Coast → Garibaldi → Dionysios the Philosopher termination Square Mavili. 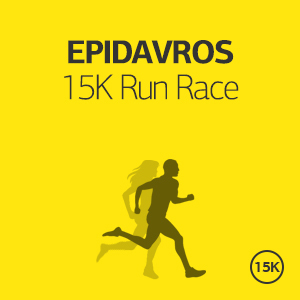 Anyone athlete after the 13:00 has not gone through the intersection Miaoulis Coast and Vogianou will continue the path from the lakeside sidewalk street, according the directions of the judge during the race and ends with his own responsibility. 30 km, lakeside flat asphalt path. The route moves on public paved roads. The route is the same as the race except for one small change at the beginning of the journey for reasons of safety of walking. Mavili Square → Dionysios the Philosopher → Garibaldi → Coast Miaoulis turn to Vogianou → C. Genimmata → reversal end C. Genimmata → turn on the 1st node Vogianou → Akti Miaouli to (Lakeside Park) → reversal before the wooden bridge and back to Akti Miaouli → Garibaldi → Dionysios the Philosopher and ending in Plateia Mavili. Water Supply Stations: At 5 km. - At 7.5 km. and a termination. Mavili Square → K. Karamanlis → C. Elijah → Garibaldi → reversal Coast Miaoulis in the Hotel Akti and back to Akti Miaouli → Garibaldi → Dionysios the Philosopher and ending in Plateia Mavili. In the general classification men and women will be awarded the 1st. Medal cup winner and diploma to the first three athletes. In categories (five-year) will be awarded the first three athletes-only three medal and diploma. The prize giving ceremony will take place in the area of termination at the end of the race (about 12:30 m.m.). 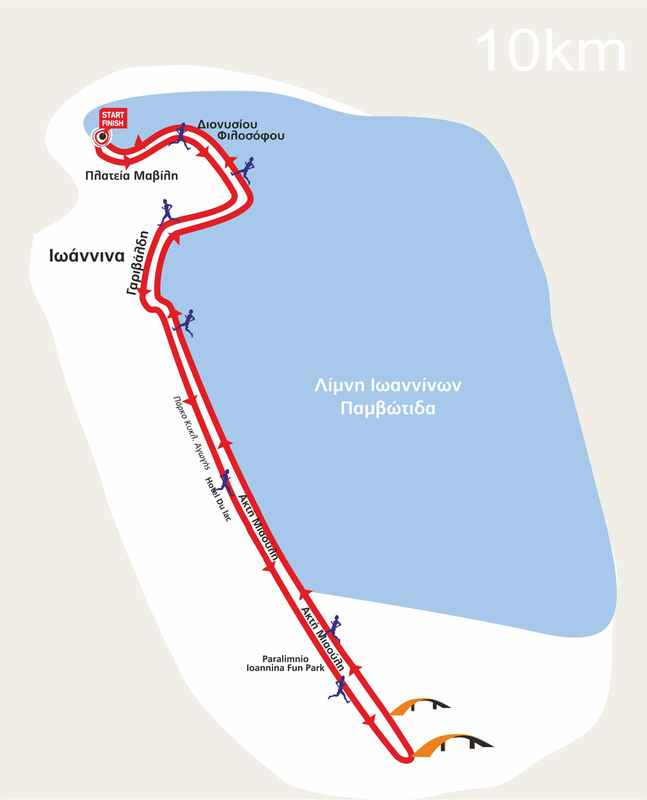 Health coverage of the race is the valuable help health agencies, physicians and volunteers Volunteer Samaritans and Rescuers of the Greek Red Cross (Annex Ioannina), throughout the length and route of the race. The organizers are not responsible for what happened during the race on Health issues due to lack of preventive medical check. It is recommended that participants have recently undergone medical examination. The organizers will request medical certificates for any athletes, since all participants are struggling with their own exclusive responsibility and minors under the responsibility of their guardians. Car of the organization with Samaritans volunteers will follow the last runners, so it collects athletes who leave the race. Those who do not need medical help, but leave the race can expect in the power stations until the car drives them back to the finish. The Special Registration Package is addressed to those who wish to come and stay in Ioannina on their own. This offer is ideal for those who want to experience Ioannina the “running way”, and get the most out of their visit in Ioannina. We have selected the ideal locations for you, and we will suggest you the ideal vacation plan. It starts from €95 per person (runner or not) for two days/one-night accommodation in Byzantio Hotel or equivalent hotel in Ioannina. If you wish to stay longer, you may add as many nights as you want for an additional €40 per night per person. It starts from € 390 per person (runner or not) for 8days/7nights accommodation in luxurious hotel in Ioannina. If you wish to stay longer, you may add as many nights as you want for an additional € 39 per night per person. Ioannina due to its unique landscape, the cool weather, the running routes around the lake and their time distance from great marathons like the Athens Marthon The Authentic, The New York marathon and many more are the ideal setting for your marathon training and for you last long run test (30K) before standing in the starting line. Whatever marathon you have decided to join this year and whatever your targert and personal best do not skip attending the Marathon training camp in Ioannina lake. There is special training for first time marathoners too. Great fun too! 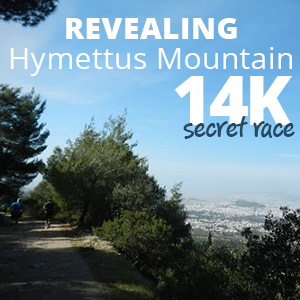 - Special marathon kit with the signature of "Athens Marathon.The Authentic"
If you wish to stay longer, you may add as many nights as you want for an additional €39 per night per person. Places are limited and sellin really fast so BOOK early and live this unique experience. Ioannina is set on the placid Pamvotis Lake and faces sheer mountains. This idyllic setting is further enhanced by an evocative old quarter-the Kastro, interspersed with narrow lanes and architectural wonders from Byzantine and Ottoman times. The lake with the island, the cave, the modern buildings and shopping centers coexist with the well-preserved buildings of the beautiful old city, the imposing monuments, the picturesque neighborhoods, the popular-art workshops, the pedestrian walkways and the large squares. It is a city that gives the chance to experience a world where Jewish, Muslims and Christians have been meeting and mixing over the centuries against the breathtaking backdrop of a castle town that evokes the spirit of a distant past. Byzantine finds can be seen at the 'little island' of Kyra Frosyni and monasteries with splendid frescoes, together with the legendary Ali Pasha's house - last refuge. The Byzantine museum at Ioannina situated in the medieval castle within the citadel is also worth visiting. The tomb and the headquarters of Ali Pasha can also be found here. A walk along the lake shores and the castle walls, next to historical places and buildings conjures-up legends such as that of Kyra Frosyni. She was sentenced to drown in the lake after having caught the eye of Ali Pasha who desperately fell in love with her. The city boasts a wide range of sporting and recreational facilities including indoor swimming pools, football and basketball stadiums, theaters, cinemas, Art Galleries, Museums, dancing floors and many colorful bars and pubs. There are also countless opportunities for extreme sports in beautiful natural locations. It is famous for the production of feta cheese and for its popular art of golden and silver pieces of jewelry and wood sculpture. The Archaeological Museum of Ioannina exhibits finds from Epirus ranging from the Paleolithic period to Roman times. They include artifacts from the sacred area of what claimed to be the oldest-known oracle in ancient Greece in the Temple of Zeus at Dodona. The Lake Pamvotis belongs to the natural eutrophic lakes with the type of vegetation called “Magnopotamion” or “Hydrocharition”. Floating vegetation is located in the water body of the lake with aquatic plants, such as the “lentil of water”, the “neighbor of the river”, “water lilies”, “irises” etc. Species with a limited distribution in Greece are also represented; for example, the “ferns of the water”. The shores of the lake and the coast of the island are covered by dense and extensive reed beds. Furthermore, the lakeside vegetation includes residues from aquatic forests of willows, aspens, and planes, as well as limited wet meadows, which flood periodically during the winter period and become particularly important sites for nesting and feeding of the wading birds. It is worth visiting Zayorohoria, on the northeast of the city of Ioannina which is a complex of 46 picturesque traditional villages built in a magical setting amidst pine and fir trees with a unique traditional architecture, impressive stone mansions and undulating, natural forest surroundings.